Best Pet Camera Reviews: See What Fido Does When Home Alone! ...do you have a problem with keeping your dog at home alone when you are going away? ...is your dog suffering from separation anxiety? ...have you tried all the recommended therapy and meditation techniques without success? If you answer yes to any of the above, then you are in the right place. In the following paragraphs are ten of the best pet camera reviews with buyer's guide that you can get for your dog. With only the push of a button, you can be connected with your beloved canine and help them acquire beautiful habits. This pet camera has an extra value because it comes with a treat dispenser. Is has a great design. This pet camera's video is great. It allows you to take snapshots and save for viewing later. Are you always in the midst of your friends? Show them you are the proud owner of a lovely pooch by snapping a nice picture of your pup with the Petzi treat cam. Summon the camera by tapping on the snap mode and in seconds you will have a clear, crisp picture of your dog to show expectant friends. This is one of the most innovative products made for pets after pet puzzles. It is a 2-in-1 product. 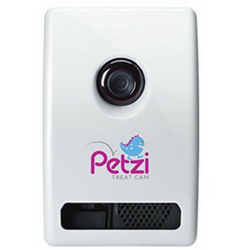 The Petzi Wi-Fi camera comes with a treat dispenser and camera in one place. You can easily synchronize data between this lovely camera and your Smartphone or tablet using the free, secure Petzi App. With the App installed on your device, you can treat, snap, and speak to your pet even while you are away from home. If your pet is already trained, you can tune to the speak mode and play...in words...with your pet. And, if you want to check in on your pet’s condition, a simple tap will get you to the see mode. Here, you can see what your dog is up to anytime, thanks to the wide-angle camera on the unit. Want to reward him for being calm when left home alone? Tap the treat launcher mode and have his favorite treat fall out. The Petzsi is a nice camera for keeping tabs on your pet when he/she is home alone. This pet camera comes with an added value with its built-in laser toy. It's video quality is in high-definition, allowing you to see the best of your pet and the background while you are away. 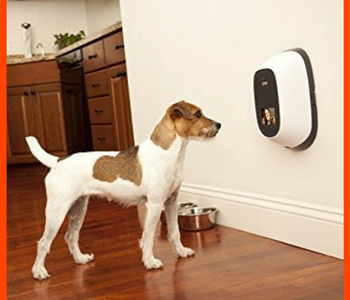 It has a 2-way communication feature that allows you to connect with your pet and vice versa. It is built strong and exquisite. The Petcube interactive Wifi camera offers you four interactive modes that can help you connect emotionally with your pet. You can see him, speak, and have fun with your pet simultaneously – even though you are out of the home. 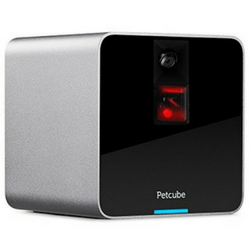 It features a distinctive laser pointer, speaker, and an inbuilt camera and microphone, which can all be controlled using your smartphone through the secure and free Petcube App. This pet camera can shoot some nice HD video and the wide-angle camera (1380) can help you take some cool shots of your pet. To see what your pet is doing at any point in time, use the see mode or use the speak mode to make a shout out to your pet. See him wag his tail or prop his ears against the camera...is he trying to figure out where the voice is coming from? You can even engage your pet in some exercises using the exclusive laser pointer when your pet is bored...whether you are at home or not, your pet will always enjoy his regular playtime and exercise. No more boring times for your pooch, just push a button and start streaming live sessions from your home alone pet. At the time of writing this, the company is still very new to the market so you may not be able to find a track record that will please you. However, many of the users of this item have praised the camera for its excellent features. This product comes with an added value with its built-in treat and train food dispenser. Trains your pet with food rewards. Hand-held remote control that operates through walls up to 100 feet. Comes with a 23A - 12V battery and Instruction DVD. You can now train your canine to behave appropriately while you are away, thanks to this revolutionary product. It comes with a remote control and you can reward your pet for appropriate behavior. The Petsafe Treat & Train Dog Trainer is more suitable for training dogs and uses affirmative reinforcement to teach your dog to behave appropriately in delicate situations, such as when a new visitor visits, during dinner or when your dog is home alone. Using this device, you can teach your dog every day skills, such as obedience, responsibility, etc. You can also engage your dog in premeditated exercises to provide enough stimulation for your canine. The advantage of the Pet Safe Treat & Train is that it can be used for dogs of all breeds and ages. Your package should include detailed instructional manual and DVD with instruction for setting up your device in no time. This pet camera allows you to talk, view and connect with your dog, and vice versa. It has an added value because it comes with a treat dispenser. It also has sound and motion detection features for added security. This product is compatible with Petchatz Paw Call, let your pet call you. 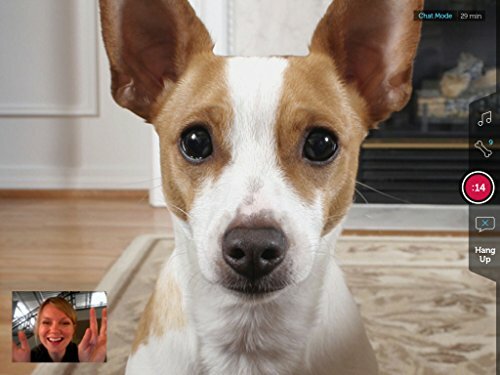 The Petchatz Greet and Treat videophone comes with lots of amazing features that will help you improve the quality of time you spend with your dog. It comes with Wi-Fi, which can be used to control the unit with your smartphone through the companion App. Installing the companion App on your phone and controlling the pet camera with your phone is easy enough. You can take videos and picture of your pets when you are at work through the camera’s video and audio recording capability. It comes with sound and motion detector that can alert you before your dog gets into trouble while you are away. The Petchaz video allows you to greet your pet, speak, hear and see it from far away. It also has scent dispenser and can deliver a treat to your pet at a specified time. With a rugged construction and treat dispenser, this device will change your perception about managing your pets. If you are like most pet parents, you are passionate about your pet and you want to give him a lot of attention, especially if he is very old or young. With the Pet Chatz﻿﻿, you can easily spy on your pet anytime, whether you are away from home or in another part of the house. You will be able to stop him from being naughty or ensure he is happy in his playroom. This pet camera can also act as a home or business monitoring camera. It is more affordable compared to the other products. It gives you a choice to view the live streaming on your PC, tablet or smartphone. This product has 2-way communication technology that allows you to connect with your pet and vice versa. This Vimtag ﻿dog camera is for indoor and outdoor use, and provides live stream with night vision capabilities. In order to operate this, you will need a power outlet as well as internet access. You can easily scope out a whole area, thanks to its pan and tilt functions. It features a motion sensor and a superior night vision for a clear viewing at night. NOTE: One complaint about the Vimtag VT361﻿, however, is that it consumes a lot of data, so you may want to make sure you have enough before you start using this item. You can record film, send pictures and change from day to night vision, set up several pet cameras and stream live to your smartphone, tablet or your PC. This dog camera produces outstanding pictures and the HD quality is as high as it can be. Many users have found it easy to set up with average setup time of 4 minutes. Whether you want to set it up in the kitchen, the dining table, the living room, or your bedroom, it takes only a few minutes to get set up and running. This pet camera has a 720p video resolution that lets you see your pet and your house in a clear crisp view. 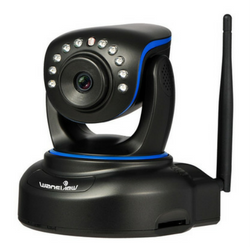 It has great motion detection and live streaming functions. It has 2-way communication technology that lets you connect with your pet. This product has pan, tilt and rotate functions that enable you to see the display in a wider view scope. This pet camera is highly functional but super affordable. This HD wireless home security system from Apeman gives you real-time stream, wireless connectivity, high definition night vision and motion detection. It has the capability to show more than one user live views of their pet and surveillance information around the home. When you are away, this surveillance system will enable you to keep watch of what is happening around your home. You don’t have to worry about your dog breaking a glass or eating up your carpet. Beyond the protection of your dog, you will enjoy peace of mind since you can keep watch on your packages and mail from being stolen. As long as you have a camera with you wherever you are, your pet, baby and other valuables are secure. The function of the HD Wireless IP camera goes beyond keeping watch on your dog when you are away. You can link the camera to your smoke detector or window alarm and it will locate the area of the alarm and record, sending you an email alert to get into action. This pet camera comes with extra features like a treat dispenser and a laser dot game, making it out-stand among the rest. It has a 2-way communication technology, allowing you to connect with your dog. It allows you to download recorded videos on the drop box cloud storage. This pet camera is easy to use and set-up. 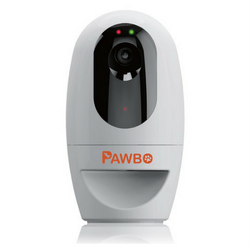 This Pawbo Pet camera gives you two way communication and an easy way to keep in touch with your family, anywhere, anytime. It comes with video recording capabilities, meaning that it can record things happening around your home, automatically download them and save it on your Dropbox account. You can play and interact with your pets while you are on a journey or far away from home, thanks to the interactive laser dot chasing game and multiple sound effects on the Pawbo Pet camera. 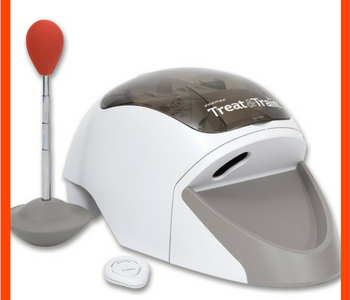 The treat dispensing function on this unit allows you to send a treat to your pet at the touch of a button. It is now easy to reward your pets when they listen to your command. Moreover, you can share adorable pictures of your pet with your Facebook, twitter or Instagram followers. What most people think about when they hear this is how much data this can consume. Although it records high quality 720HD videos, it will NOT kill your data. To receive live streaming of footage recording, you need to install the Pawbo App on your Android or iOS device. 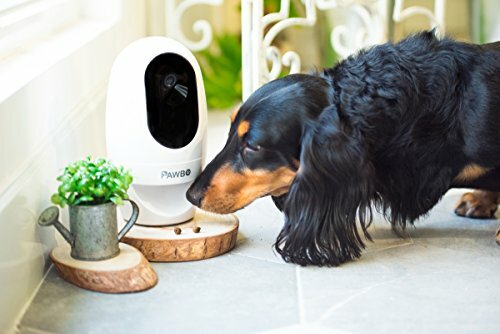 This pet camera has a 2-way communication technology, allowing you to connect with your pet in the most effective way possible. It comes with a 3.5 inch LCD video monitor that lets you check on your pet without having to use another communication device. This pet camera supports reception even if the camera and the remote are 590 feet away from each other. The Motorola Pet Scout camera is compatible with Android and iPhone devices as well as tablets. In addition to these devices, you can configure and control the camera through your PC too. Not only does it function well in areas where there is not a lot of light, it also provides remote operation when you are not in the house. 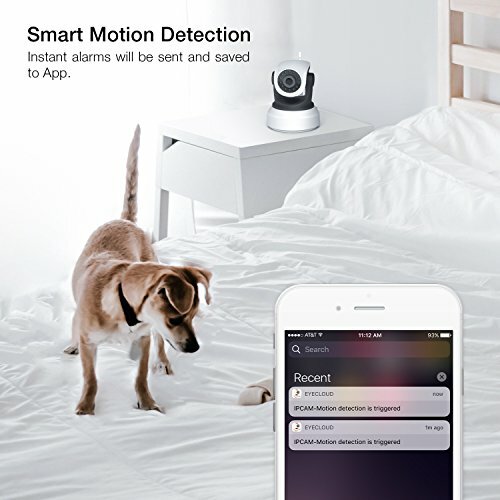 It has zoom, tilt, and pan functions and the camera is powerful enough to cover all of your dog’s activities, even when you are not at home. The beauty of the Motorola scout is that you can connect up to four cameras to it, if you are looking for a way to keep your dog under your arm. NOTE: Although most customers have a good experience with the Motorola Pet Scout﻿, some have actually complained of features that impair usability. This product does not just act as a pet camera, but also an an outdoor home or business monitoring camera. It has a superb 1080p video resolution, allowing you to view crisp, clear and quality videos. It is built tough and rust-resistant with its aluminum structure. This pet camera has a night vision function allowing you to monitor your house and check on your pet at night-time. This Wansview Security﻿ ﻿C﻿amera allows you to connect with your Android or iOS smartphone using the Wansview App in only three steps. Once it’s installed, you can view your dog’s activities and monitor the house when you are not around. The Wansview dog camera also has an inbuilt Antenna for getting reliable Wi-Fi connection. And, with the two-way audio capability, you can not only talk to your pooch back home, you can also listen to them. With 1080P HD, you are looking at the highest quality video you can get from any camera. The video equally supports playback so that you can shove it aside and watch it later if it’s not urgent at the moment. To monitor your home and keep tabs on your dog when you are absent from home, all you need is a Wi-Fi network that can be paired to the Wansview App. 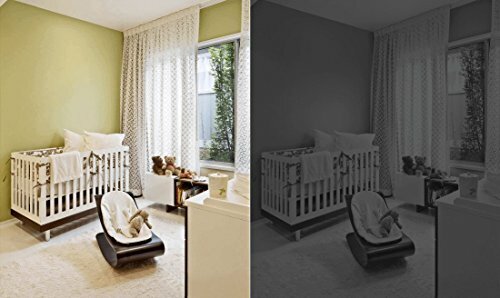 This product can also serve as a home monitoring camera. It as a high-definition video resolution, allowing you to see your pet and the house in a clear and quality view. It has playback feature, allowing you to check what your pet was doing or your house while you're away. This pet camera has a night vision function allowing you to check on your pet as well as your house even in the dark. Very affordable compared to others. 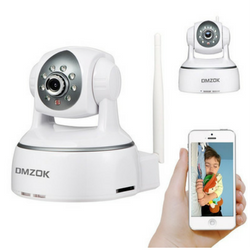 This DMZOK IP Wireless Pet ﻿Camera is not only easy to install but also easy for a non-tech person to operate. You don’t need to be a savvy person or get hung up on the manual before you can operate this camera successfully. You can either operate the DMZOK 720 using a network cable or wireless connection. Because of the high quality images that you can get from this unit, you can be far away from home and still be able to see clearly what is happening inside and around your home. This pet camera has a superb 1080p video resolution, allowing you to see your pet and the background in a clear and crisp view. It has a 2-way communication technology which allows you to connect to your pet and vice versa effectively. It is easy and quick to set up. This pet camera has pan, tilt, zoom and night vision functions that allow you to view in a wider scope and at night. This Amcrest IP2M-841 ProHD 1080P Camera is among the best pet cameras in the market with a superb video quality. It has a ProHD 1080p video resolution that allows you to check your dog or even your house in the clearest and best quality possible. Also, this pet camera has a 2-way communication system that allows you to connect with your fluffy buddy and vice versa. This pet camera is easy and quick to set up. 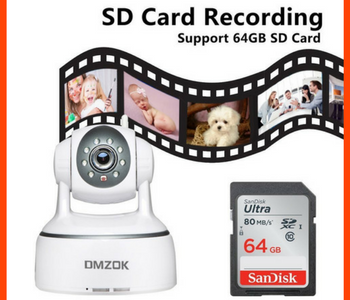 It comes with a free continuous 4-hour cloud storage which enables you to check what the camera has captured and what your dog was doing while you are away. Also, this Amcrest IP2M-841 ProHD 1080P Camera has pan, tilt and smart zoom options that allow you to see your house’s interior in different view scopes. Also, this pet camera has a night vision feature that lets you check your dog well, whether day or night. With the features this Amcrest IP2M-841 ProHD 1080P Camera has, it is definitely a good catch. NOTE: Aside from the fact that its app is not developed well, and it may have issues when connected through the Wi-Fi, it does a great job in most areas. 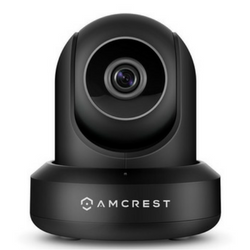 The Amcrest pet camera enables you to connect with your pet and allows you to check your house from time to time, wherever you are. Therefore, this pet camera is still one of the best because it does its primary functions well. In addition, it would be a total catch if your pet camera has a built-in laser toy and a treat dispenser, so that even though you are away, your pet remains safe, active, entertained and well-fed. It is essential to have a pet camera with a superb live streaming quality and capability. Since this kind of camera is not limited for viewing pets but for monitoring the house as well, it would be best to get one that delivers clear, crisp and quality video resolution. Lastly, it would be best if the pet camera you are going to purchase has a 2-way communication technology, so that you are not the only one who can connect to your pet, but also vice versa. This also serves as another means of communication in case you are away and somebody is left in your house, and you want to know how they are doing. All thanks to innovative technology, you get to connect with your best buddy no matter where you are! So, you and your pet won’t have to experience that longing for each other, because you get to communicate more often and check your pooch out no matter where you are. ***We hope you enjoyed reading our write-up of the best pet camera reviews. If so, we would love to hear from you in the comments below!